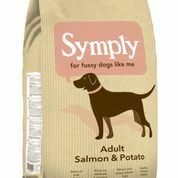 Symply Salmon & Potato is a delicious alternative to rice based dog foods with the added benefit of being high in Omega 3 & 6. Nutritious and mouth-watering, the tasty Scottish salmon is a favourite with even the fussiest dogs. Symply Salmon & Potato has been carefully formulated to be a highly digestible and hypoallergenic food, a great choice for all dogs.